WELCOME TO EMILIACOUTURE – HOME OF MINIATURE HAUTE COUTURE AND INAMORATA ART DOLLS! NEWS: INAMORATA 3.0 PROTOTYPE IS FINISHED! I am Emilia Nieminen, Finnish doll designer behind Inamorata dolls and emiliacouture brand. I started collecting and repainting dolls on 2006 and the hobby soon gained a life of its own. On 2009 I won an international CDDC (Couture Doll Design Challenge), a contest in designing doll fashions and got my first two features in American doll magazines. It made me believe that the hobby could turn into a career. 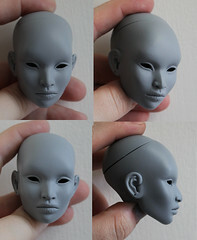 On 2010 I began developing my own doll, and slowly hand sculpting it from wax for two years. On 2012 the first Inamorata doll was unveiled at IDEX doll convention and the doll was awarded DOLLS magazine Award of Excellence on 2013. Inamorata are 16″ art dolls for adult collectors. In creating these dolls, I wanted to convey my personal aesthetic and value personality over the stereotypes of Western beauty. The first doll I made was Asian and the second African. I think there is beauty in diversity and I love making ethnic dolls with freckles, vitiligo, scars and wrinkles. All the things that life draws on us. I am dedicated to uniqueness, original design and painstaking craftsmanship, want to keep the tradition of hand sculpting alive. 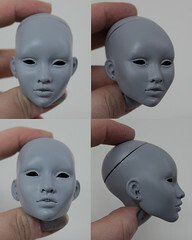 Each doll sculpt is handmade by me before sending it to the casters. I love tactile sensation of working with the doll, be is sculpting, painting, hair or fashions. I take pride in guaranteeing that no two dolls are alike. Same meticulous care and inspiration goes into creation of each garment that I design. My favourite fashions designs are rather “sculpted” than sewn. I usually hand stitch and wet sculpt the garments on the doll for that deliciously tight tailored fit that licks each curve like second skin. I love using haute couture techniques such as rouching and other fabric manipulation to create three dimensional textures and forms that accentuate and exaggerate the silhouette. I have a deep rooted fascination with mythology and ethnography. I want the dolls to tell a story. I tend to rotate towards the darker aspects, creepy and crawly: insects and snakes; horrors of everyday society that we often ignore and should be reminded of. I also gain so much inspiration from travelling and have been rather nomadic for the past years. I believe dolls become art when one is able to convey something more: a deeper meaning, a story, social commentary, something to elicit an emotional response from the viewer. First time I see David!!!! How can I purchase one??? Dollshe David Kuncchi is not one of my dolls. 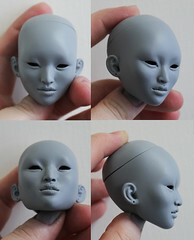 I did paint this one but the sculpt is from a Korean BJD company Dollshe and you can order him through their website. 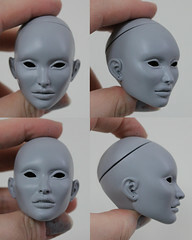 He is a perfect proportion male doll for Inamorata ladies and Dollshe has other head sculpts to select from as well. I love your work Emilia- the faces you paint are so intense, and your costuming skills are killer. I wish you’d do a show in Seattle some time!